Yesterday, Judd went out in the backyard to fire up the Big Green Egg. He called back inside to tell Charlotte there was a frog in her little pool. She acted quickly and ran upstairs to get her bug catcher. She didn't hesitate to stick her net in the water and scooped up that frog on the first try! 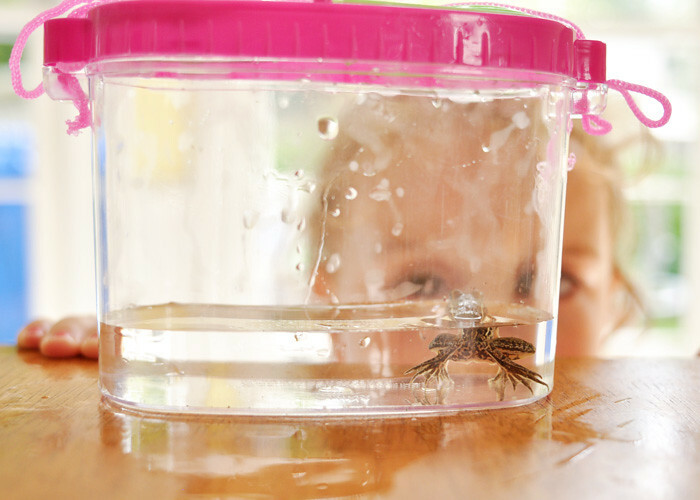 She dumped him into the bug catcher, put a little water in it, and put the lid on. I was impressed - it's like she had done it a thousand times. He was her pet for 20 minutes. She released him back into the backyard without a scratch on his body. love it! Matthew would be very impressed :) *I* am very impressed that she released it!